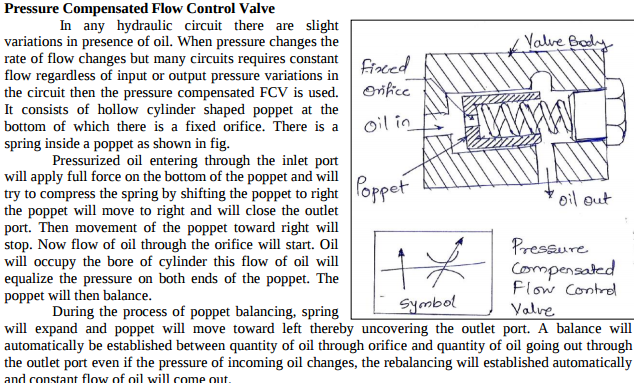 Draw and explain working of pressure reducing valve. Draw and explain working of pressure reducing valve. The main function of pressure reducing valve is to reduce the pressure in particular branch of the circuit to different level as demanded by consumer in that branch. Construction: It consists of spool and spring housed in the bore of valve body. Spring compression can be adjusted by pressure setting screw. Port P is pressure port connected to pump. Port A is consumer port requiring reduced pressure. spool and spool will shift to right thereby partly closing the port A. Now only enough flow will pass through port ‘A’ so that consumer connected to A will receive reduced pressure. What is an accumulator ? Why accumulator is necessary for huge hydraulic pressers ? makes available to the system whenever required. Necessity of accumulator for every huge hydraulic press: Oil requirement of the system is not continuous but intermittent. A hydraulic press needs the oil only during the lifting operation. While, during the lowering of load, holding the load or during idle period, it doesn’t not require any supply of oil. During such period, the hydraulic pump has to stop or delivered oil must be drained back to the sump. 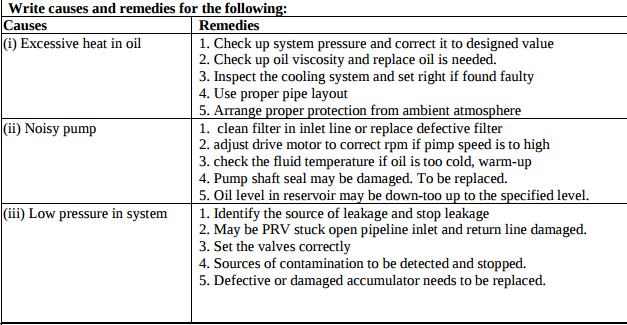 But frequent starting and stopping of pump is not desirable as it reduces the pump life. Also, draining the pressurized oil is wastage of power which reduces the system efficiency. The remedy to above problem is to use accumulator in the system. Write the causes and remedies for the following : (i) Excess heat in oil (ii) Noisy pump (iii) Low pressure in system. What is pressure compensated flow control valve ? Explain with sketch. Explain 4-way-3 position direction control valve used in hydraulic system. 4-way-3 position direction control valve used in hydraulic system is known as 4X3 DC Valve. The valve has four ports and three positions. Following figure shows the Normal and working positions of DCV. Spool of this valve is having three positions. The spool is so selected because we have to obtain third position also called as ‘Closed Centre Position’ This position is shown in figure. We have shifted the spool in such a manner that all ports are closed to each other. Mo flow from port P to port A or B and no flow from port A and B to R. When DC valve attains this position, pressured oil returns to reservoir via pressure relief valve. The closed center position of DC valve is suitable for immediate closing of movement of actuator. What are actuators ? Draw a double acting cylinder. Actuator - Actuators are those components of hydraulic / pneumatic system, which produces mechanical work output. They develop force and displacement, which is required to perform any specific task. An actuator is used to convert the energy of the fluid back into mechanical power. 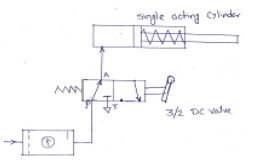 State any two applications of 3 × 2 DC valve. Draw symbol for the same. Compare pressure relief valve and pressure reducing valve. Explain any two mounting methods of cylinder. 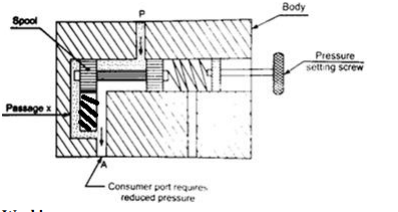 With a neat sketch explain pressure compensated flow control valve. Draw symbol of it. Name any eight pipe or tube fitting with their application. What is seal ? Classify seals according to shape. State the factors for seal selection. 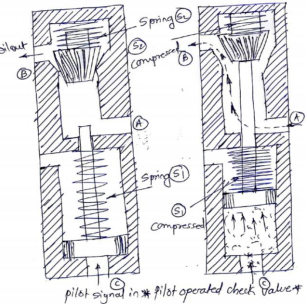 Discuss pilot operated check valve with neat sketch. When pilot signal of pressurized oil is used to control movement of poppet in the check valve, it is called as pilot operated check valve. It is used when no flow characteristics of the valve is desired only for a portion of the system cycle. 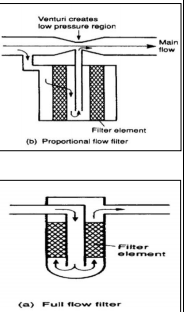 Figure shows the pilot operated check valve. A pilot piston is introduced below moving poppet. This pilot piston can move up by introducing pilot signal. Working: In normal position there is no flow from (A) to (B) because the movable valve poppet has blocked the flow. Now pilot signal is given through port (C). This oil will push up the pilot piston upwards, thereby compressing springs (S1). The piston rod of pilot piston will push the movable poppet in upward direction thereby compressing the spring (S2). Now the flow from (A) to (B) will start. As and when we cut-off the pilot signal the flow from (A) and (B) will continue. When pilot signal will be cut-off, spring S1 and S2 will expand and moving poppet will again block the flow from (A) to (B). State the four merits and demerits of using a rubber hose in pneumatic circuit. Draw symbol of unloading valve and sequence valve. 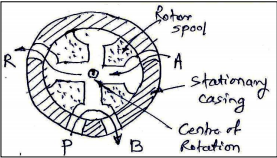 Explain with neat sketch the working of rotary spool type DC valve. Draw symbols of: (i) Oil reservoir (ii) Oil filter (iii) Heat exchanger (iv) Unidirectional fixed displacement pump. What is the use of direction control valve? Explain with sketch. 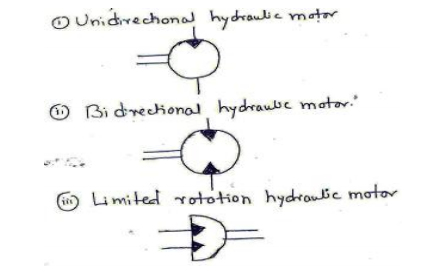 Draw symbol of any three types of Hydraulic motors. 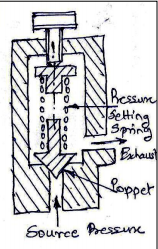 Explain working of directly operated (Poppet type) check valve with neat sketch. oil to flow. Hence oil can flow from port A to port B. when under pressure is supplied in opposite direction that is to port B, the oil force the ball to sit firmly in its seat, hence the passage is closed by ball. The oil cannot flow port B to port A.